"Principles that are used in limitation are not the means for the discovery of the infinite"
In every situation, individuals use their senses to acquire and evaluate new information. However, it becomes obvious that there are limitations to the abilities of the brain and senses when it comes to the discovery of the unlimited truth. What human beings call wisdom and rationality, and use to measure truth, is in fact only a limited view of reality, and has little to do with the truth of universal wisdom and knowledge. The ability of the brain to discover truth is limited. The brain depends on information it receives through the senses. The natural limitation of the senses, limits the brain’s capacity to recognize the truth. How does the brain process the information? The human brain consists of millions of neurons, and each organ of the body has its own particular center in the brain. The information received by the senses is transferred through neurons by an electrochemical process. Through the pattern of electrochemical exchanges between neurons, the brain receives, analyses, and transmits all the information necessary to carry out its functions. When the electrical impulses reach a particular center of the brain, they create electrochemical patterns. The brain compares and contrasts these patterns with the information, which is already stored in the memory, and as a result a person responds to a situation based on the interpretation of the information stored in the memory. Our brain functions much like a computer. Whenever we face a new idea or an unknown subject, this information is processed in our mind just as someone who presses a key on the keyboard of a computer. The brain then compares this new entry with the information already stored in the memory. Based on this information, we accept or reject a new idea. This process is usually called "thinking." Therefore, acceptance or rejection of new ideas is based on limited information gathered through the senses and the information stored in the memory. The brain’s output depends on physical inputs received through our senses. If the given inputs are incorrect, its output is also incorrect. For example, we know that our senses are limited because they can only receive the waves that are within a certain wavelength. We cannot perceive light waves or sound vibrations with a frequency or wavelength above or below a certain level. Our ears, for example, can only hear the sound vibrations between 16 and 16000 hertz. Similarly, our eyes can only see a limited part of the spectrum of light waves; infrared light is inaccessible to our senses, even though it can be measured with technical tools. The senses, with all their limitations, cannot guide us toward the path of self-discovery. Our acquired knowledge helps us form an image of reality but it is not the reality itself. Reality must be received, not perceived. Perception is based only on the brain’s comparison of what has been previously recorded in the memory. It is the brain’s translation of information provided to it by the physical senses. To recognize the constant essence of the human being, to discover the reality of the "I", one must venture beyond the limitations of the senses. Of course, one needs to use the tools that are in harmony with existence. Therefore, the concentration of abilities (Tamarkoz®), and the establishment of harmony are required to begin the journey of self-knowledge. 1. Nader Angha, Theory "I": The Inner Dimension of Leadership (Riverside, CA: M.T.O. Shahmaghsoudi Publications, 2002), 130-133. 2. 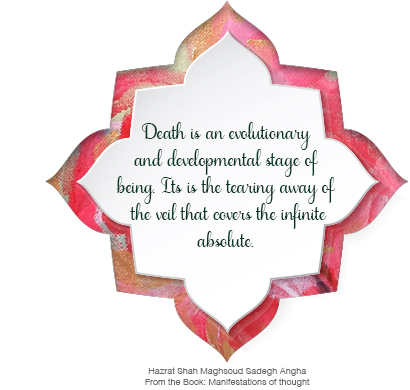 Hazrat Shah Maghsoud Sadegh Angha, Dawn (Lanham, MD: M.T.O. Shahmaghsoudi Publications, 1989), 29.